This 20-hour course will teach you the various aspects of the mortgage lending industry such as loan finance documents, the laws that must be followed, the importance of ethical conduct, how to watch out for fraud and other nefarious acts, how to complete a loan application and the process for loan approval, and various different loan programs that are available to consumers. Some states require state-specific prelicense education in addition to the standard course. Please check with your state regulatory agency, the NMLS, or contact us to verify if the jurisdiction you are becoming licensed under requires additional state-specific training. This course is structured to be completed in a 4-day class, Monday through Thursday. 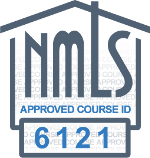 As required by the Nationwide Mortgage Licensing System (NMLS), sections of the course will unlock as the class moves together through the course material, ensuring that no student moves faster than the rest of the class. Instructor-led sessions will be available during the course enrollment period where students can interact with an educator to have questions answered or to help enforce the information that was covered during the course session. Quizzes are given throughout the course segments. Please review the course syllabus for the schedule of course topics available on each day of the class. This is an online instructor-led course that contains online reading materials, audio presentations, and video presentations. Students will need to have a current internet browser and computer speakers. The instructor-led sessions are presented using Citrix GoToMeeting software, but a webcam is not required. An audio bridge call-in number along with the session dates and times will be given to the students when the class begins. NMLS functional specification define that a 20-hour mortgage loan originator prelicense courses MUST be completed within 14 days of the course session start date. Students who do not pass the final exam before the enrollment period expires will be marked as failing the course. Refunds will not be issued for failed courses. Extensions to lengthen the 14-day enrollment period are NOT available. Students who fail the course can enroll for a new course session and must start from the beginning. Included in this bundle is a supplemental online study guide to help you retain the information covered during the instructor-lead session. Each segment from the prelicensure course has a corresponding chapter in the exam prep guide, containing additional test questions to help you remember the segment topics. At the end of the study guide is an exam based on the same requirements as the actual licensing exam: 125 questions in 190 minutes with a minimum 75% passing score. The exam prep study guide does not have to be completed to pass the MLO education requirement, but may be useful for preparing to take the NMLS mortgage loan originator licensing exam. This test prep webinar is for preparing for your licensing exam after you have completed the 20 hours of study time. When registering, please select a session that will be on a date later than your anticipated prelicense course completion date. The online final exam will be presented at the end of the course. The final exam is not timed, contains 25 multiple choice questions, and requires a 70% or higher passing score. Students can take multiple attempts at passing the final exam, with each attempt containing a new set of test questions. The final exam must be completed before the end of the 14-day class session to receive credit for passing the course. NMLS functional specifications define that a 20-hour mortgage loan originator prelicense courses MUST be completed within 14 days of the course session start date. Students who do not pass the final exam before the enrollment period expires will be marked as failing the course. Refunds will not be issued for failed courses. Extensions to lengthen the 14-day enrollment period are NOT available. Students who fail the course can enroll for a new course session and must start from the beginning. After successfully passing the final exam, OnlineEd will notify the Nationwide Mortgage Licensing System (NMLS) that the mortgage loan originator pre-eduction has been completed by the student. It is OnlineEd policy to have credit uploaded to the NMLS by the end of the following business day. The student will have a printable course completion certificate available after passing the course final exam. The certificate is for the student's personal records and is not confirmation that the NMLS has received the notification that the student has completed the course. Click on the Composite View tab. Click View Individual on the sub-header row. The number that appears in parentheses after your name is your NMLS ID number. This segment will give you an overview of the mortgage lending industry. Students will learn about various types of lenders and the parties who are involved in the mortgage lending process. This segment will explain the various promissory notes that are available. Students will also learn the three main types of security instruments used in residential purchase transactions. There are many terms and words used within the mortgage industry that aren't a part of the everyday person's vocabulary. This segment will outline many common words and loans used in the lending industry. This segment will outline many of the important federal regulations and rules that students will need to comply with when working with borrowers on residential loan transactions. Interacting with the public must always be done in an ethical manner. There are many courtesy standards that should be followed, as licensees are expected to protect the loan applicant's interests and not take an unfair advantage of an applicant in order to earn a commission. This segment will outline the ways in which loan fraud is used for illegal activities, the programs that companies are expected to create to detect fraud, and the various ways that criminals try to trick lenders (and mortgage loan originators) into financing their property purchases. This segment will outline both the standard loan application and the Loan Estimate disclosure. Students will also learn about credit scores and what to look out for when working with documents submitted by applicants to support their personal financial obligations. Appraisals are often used to confirm that the property being used as collateral for the loan is adequate in case of borrower default. If the lender has to take the property and sell it, the property should be worth enough money for the lender to recoup its financial loss. In this segment students will learn about the CFPB's Closing Disclosure. This form is in conjunction with the earlier Loan Estimate and discloses the final details of the approved loan to the borrower. Financial transactions naturally involve a lot of math calculations; the amount to be repaid monthly, how much interest a loan will accrue during its term, and so on. Students will also need to be able to take the income and debt values supplied by the loan applicant to determine if he or she will even meet the minimum qualifications for the loan being applied for. There are a variety of loan programs available for applicants to qualify for. This segment will give students an overview of a variety of loan programs that borrowers can apply for. This course will remain available to students for 14 days after purchase. This course is a study guide to help licensee applicants prepare for the mortgage loan originator licensing exam. Each chapter of this course contains a study exam of test questions that students can use to help retain the information taught during the 20-hour national prelicense course. Each chapter's study exam presents a large number of questions for students to test themselves on. As each question is graded as correct, the number of questions available in the chapter's prep test will be reduced until the student has correctly answered all of the questions in the chapter. Progress can be reset at any time if the student wants to be presented with all of the chapter's test questions again. At the end of the course is a test based on the same timing requirements as the NMLS MLO licensing exam. The test will present 125 questions in a random order. Students will have 190 minutes to achieve a 75% or higher passing score. This sample exam may be attempted as many times as desired. Completing this module is not necessary for earning credit towards completing the prelicense education requirements to earn a mortgage loan originator license. This course will remain available to students for 365 days after purchase. According to the Nationwide Mortgage Licensing System and Registry, the NMLS Mortgage Licensing Exam has an overall pass rate of 53%!!! Forty-seven percent of the individuals who attempt this exam never pass it. Sure, you can take the test again if you fail, but you'll have to pay for it again and wait 30 days. After failing the exam three times, you would have to wait SIX MONTHS before being eligible to take it once more. If you need to originate mortgages to keep your job and earn your income, and you need a license to originate mortgages, and you need to pass this examination in order to get your license, can you really afford to waste your time and money attempting this exam over and over again? Our NMLS Test-Prep live Webinar will position you for success at the front of the starting line. the opportunity to sign up for one-on-one, personalized test-prep tutoring. This 2-hour webinar session will share proven exam-taking and study strategies with you that have assisted numerous test candidates build their confidence and pass this exam. Created and delivered by a seasoned mortgage professional, mortgage instructor, and trainer, this webinar can increase your odds of knocking the NMLS national mortgage licensing examination out of the park on your first attempt. Think of this as an investment in yourself, your career, and your success. Can you really afford not to? Sign up today! Rich Leffler is the President, CEO, and Senior Instructor of AxSellerated Development, LLC, a success coaching and mortgage consulting firm dedicated to assisting others achieve personal and professional success. In addition to being a charismatic, captivating, and sought-after personal success coach, instructor, NMLS exam tutor, and speaker, Rich is responsible for creating, coordinating, and executing training curriculums affording new mortgage loan originators and those considering a career in mortgage lending with the fundamental skills necessary to originate successfully and compliantly.